I feel in reserve. I am sitting in a B&B drinking coffee. It’s seven a.m. We need to figure out how to get a Pizza Hut pizza to Dave’s grandmother before her normal lunchtime of 11:30. Pizza Hut opens at 11. Grandmother expects to go out, but after spending the day with her yesterday, neither of us feels up to the task. After much hemming and hawing I finally told her, “I’m sorry we’re not more confident about getting you in and out of the car. We don’t want you to fall,” but she ignored that, or didn’t hear it, or revised it into something else. The take-off was so smooth that after an hour in the air I almost said, “Take small planes off my list, this is great,” but five minutes later we started bumping and hurtling through space. Suddenly I could feel the speed we were moving at, in the rattle of my seat and in my chattering teeth. I realized that one of the things I take for granted about flying is that you rarely feel like you’re actually moving. I couldn’t tell whether this was normal turbulence or pieces of the plane falling off. I looked down the aisle and the flight attendant was sitting in her jump-seat. I gripped Dave’s leg and he covered my hand with his. Other passengers were looking straight ahead but no one was screaming. I saw these things in snatches because I was slightly less nauseous with my eyes closed. I wasn’t so much afraid of dying as I was that I might need to take some kind of action and not be able to because of nausea. Dave was trying to read his iPhone, but as the plane lurched like a wagon down a mountainside, he raised his eyebrows at me and turned to the window. I shrieked, “Is something happening?” But the plane noise was so loud even I couldn’t hear myself. I shut my eyes again. A few minutes later, the flight attendant announced, “The captain has begun the final descent into Wichita. Please make sure your tray tables are stowed and your seat backs etc., etc.” We landed smoothly and no one clapped, so I knew it wasn’t a big deal. As we walked to Dollar Rent-a-Car, Dave surmised that we’d been moving through storm turbulence and the captain probably descended more quickly than usual to get us out of it. I decided that after the return flight, I will never fly again. Unless it’s somewhere I really want to be. But I’ve decided that before, and I always forget. We called Pizza Hut and they told us to be in the drive through at 11:10. By the time we get to Grandmother’s the pizza will be cold, and she’ll still wonder why we aren’t taking her out. Come on, Self. One more day. 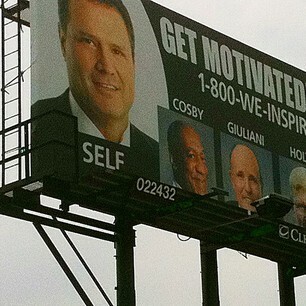 If Cosby and Giuliani can do it, Self can do it, too. I’m laughing at you calling it a “jet”….as always, love your stuff.